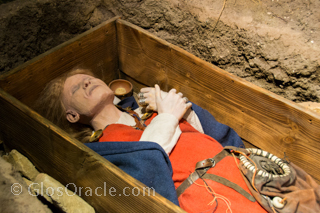 The Gloucestershire Oracle did a spot of time travelling recently at the Corinium Museum in Cirencester. If you think museums are stuffy and boring, then you are in for a surprise when you visit this one! Entering the Museum is rather like entering the Tardis, as it appears much larger inside than on the outside! The Visitor Reception area is light and spacious and the member of staff who issued our tickets was friendly and helpful. There were two magnificent Roman floor mosaics mounted on the wall in the lobby - both of which were excavated from sites in Cirencester - and somehow we knew we were going to enjoy our visit! Before entering the first gallery, visitors pass the stratigraphy wall – a reconstruction of a cross-section of an archaeological site – in which objects from different eras have been placed. This is great idea to show children how humans have left their mark for archaeologists to discover. 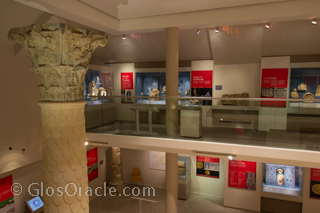 We found it helpful that the galleries were laid out in chronological order, with the first one being dedicated to the Neolithic Period and Iron Age. Here we learnt about the local Dobunni tribe, who it seems were more sophisticated that you might think. 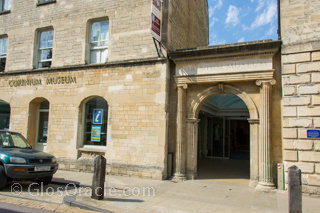 As the Roman town of Corinium was the second most important after London, it is unsurprising that most of the Museum is devoted to the Romans and the remarkable collection of artefacts that have been found in and around Cirencester. 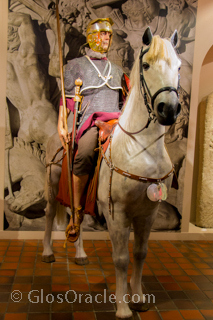 The first Roman gallery features the military occupation, complete with a life-sized Roman cavalryman on horseback! The tombstones of two Cavalry Troopers are quite poignant. There was an area for the kids to dress up in Roman tunics and feel the weight of the helmets. 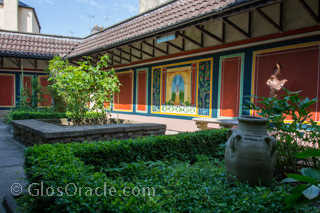 If you take a stroll outside in the Roman garden, you will see many of the herbs and flowers introduced by the Romans. Further on you learn how the town of Corinium developed, including its large amphitheatre and forum; how shops and domestic buildings were constructed, as well as about the everyday lives of the Roman citizens and slaves. On the mezzanine floor there is an impressive collection of gravestones which give a surprising amount of information about the deceased person, from which short films have been made to tell their stories. The Anglo-Saxon and medieval galleries continue to tell the story of Cirencester and its citizens after the Romans withdrew. Visitors learn about the importance and power of the Abbey, the wealth the wool trade brought to the area and the dissolution of the Abbey by Henry VIII. The Civil War period is also well covered and highlights the devastating effect it had on the economy and the local people. This is especially well illustrated when you see the Weston-sub-Edge hoard of coins buried during the Civil War. Consisting of 307 silver and 2 gold coins in a specially made lead pipe, complete with a scrap of paper declaring “Ye Hoard is £18” - you have to wonder about the desperate circumstances under which it was buried and why it was never reclaimed by its owner. Throughout the galleries, there were lots of touchy-feely tables and interactive displays for children of all ages (and adults too!) to enjoy. The information boards throughout the Museum were very informative, without being too long-winded. We thought the short notes on the bottom of some of the boards (marked by the greyhound symbol) were just the right length for children to understand. The quality and sheer number of mosaics and artefacts on display is quite incredible and you can understand why the Museum has won many awards. There is a small gift shop selling souvenirs and gifts, which you can visit without entering the Museum itself. There is also a café on the premises. The toilet facilities were good. The cost of entry at the time of our visit was £4.95 for an adult and £2.45 for children (5-16 years). Considering we spent approximately two hours browsing the Museum we felt this was value for money. The Corinium Museum underwent a major refurbishment in 2005 costing £5.7m and now boasts a state-of-the-art lecture theatre, meeting room and gallery space which are available to hire. Whether you are a local resident or visitor to Gloucestershire, we would recommend a visit to the Corinium Museum. Museums are particularly popular in the winter and on rainy days, but can be a lot quieter on a sunny day! During the school holiday there are holiday trails for children around the Museum, as well as drop-in family activities. Throughout the year there are different exhibitions in the gallery, interesting evening lectures on a variety of topics and there is even a film club. Check out the Corinium Museum website for further information. We believe in supporting the businesses that we review. As such, we happily paid for full entry! This website is funded entirely by Google Ads and kind sponsorships.